To help you decide which of today's many roofing materials will work best on your home, take a look at our quick, cut-to-the-chase rundown of the most common options. Whether you are building a new house or renovating your current home, the roof will be one of the most important choices you make. Aesthetics are important, but so too are your roofing material’s cost, weight, installation requirements, and suitability for your climate. More often than not, if you are remodeling, the existing roof will determine your choice of material. In addition, the condition and geometry of the existing roof may affect the cost. For example, if old roofing needs to be removed or the roof deck needs repair, or if your home has multiple chimneys, intersecting rooflines, skylights, or other elements, you can expect to pay for the additional work required for a quality installation. As is the case with exterior siding, the style of your house will influence your choice of roofing material. Know, however, that many different types of roofing materials offer similar looks—composite shingles can look like slate, metal roofing can look like wood shakes, and some asphalt shingles can even provide solar benefits. Use this roofing guide to familiarize yourself with the options, then talk with a qualified roofing contractor who can explain the differences between the materials and outline their benefits and costs. Asphalt shingles have long been the go-to standard in residential roofing, and with their affordability, easy installation, and wide availability, their popularity hardly comes as a surprise. Although they used to be considered plain-Jane, these days asphalt shingles can be made to mimic the look of slate, wood shakes, or even tile. Fiberglass shingles are made of a woven fiberglass base mat covered with a waterproof asphalt coating and topped with ceramic granules that shield the product from harmful UV rays. They are available in a full range of styles and colors to complement any home’s architectural style. Traditional organic mat-based shingles are heavier, thicker, and more costly. They are also more absorbent and can warp over time; the additional asphalt content also makes them less environmentally friendly. Manufacturer warranties generally guarantee a lifespan of 15 to 30 years, depending on factors like climate and roof pitch. Tile roofs, commonly associated with Southwest-style and Mediterranean-inspired homes, are extremely durable, lasting for centuries in some cases. Whether made of concrete or clay, individual tiles are often molded in barrel shapes for secure, interlocking installation. Clay tiles are more colorfast, durable, and costly than their concrete counterparts. Weight will be an issue, so be sure to ask a structural engineer if your roof framing will support a tile application. While both clay and concrete offer top fire and impact ratings, they are more difficult to install and repair. Wood roofs are made from cedar, spruce, or treated pine, and are especially appropriate for older homes and those based upon historical styles. There are two types of wood roofing: shingles and shakes. Wood shingles are machine-cut and tapered for a trim, crisp appearance. Wood shakes are hand-split, giving them a more rustic appeal. Wood shingles last about as long as asphalt shingles (about 30 years) but can cost six times more. Shakes and shingles have their own specific installation requirements, making them more difficult to install but relatively easy to repair and replace. Wood shingles and shakes require periodic treatments with preservatives and fungicides in order to keep from drying out, warping, cracking, and being attacked by mildew and fungus. Slate quarried for roofing is dense, sound rock, and is exceedingly tough and durable. 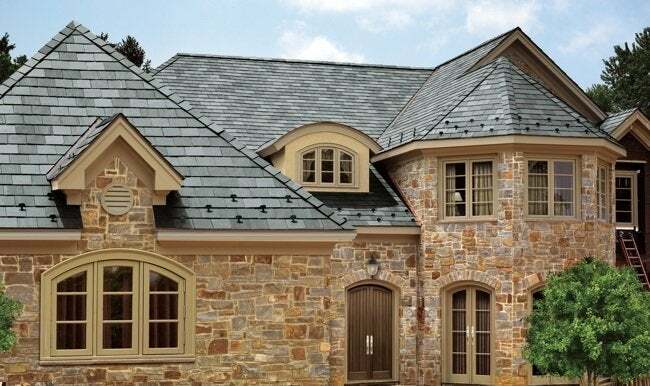 Although it is labor-intensive and costly to install, a natural slate roof will give a building character that can’t be achieved by any other roofing material. Slate roofing is noncombustible and waterproof, and it requires little to no maintenance over the course of its long life. Most slate roofs have an extended lifespan; those from Vermont and Virginia can last more than 50 years. Metal roofing is generally made of steel, aluminum, or copper, and can be stamped into many shapes and styles. There is no material more capable of protecting a structure from wind, rain, hail, fire, or rot than a durable and energy-efficient metal roof. For decades, metal roofs meant corrugated panels, which looked like they belonged on sheds or barns. Today, metal roofing products are available in a variety of styles—from standing seam to shingles—to suit a wide range of architectural styles. Metal roofs are lightweight, allowing them sometimes to be installed directly over old roofs. They are effective in preventing the spread of fire when hot embers fall on them (for example, from brush and forest fires); some insurance companies will give you a discount if you have a metal roof. Composite shingles are newcomers in the roofing arena. Made from poly-based products, they are lightweight, fade resistant, fire safe, and generally warrantied for up to 50 years. Some composites are so realistic that they have been approved for use in historic preservation. Several companies have developed composite shingles that successfully mimic everything from slate to wood. Top-tier manufacturers generally boast high fire ratings and impact resistance. Composites can carry a high price tag, and in some regions you may find it difficult to locate a certified installer. Finding increasing use in both rural and urban areas, green roofs are living systems of soil, compost, and plants. In addition to filtering pollutants and offering added insulation, they absorb storm water instead of allowing it to run off. Their requirements are many, however. A green roof system typically comprises as many as nine layers. These include structural support, a vapor-control barrier, thermal insulation, waterproofing, drainage, a filter membrane, a growing medium, and, finally, the vegetation itself. Whether you are able to install and cultivate a green roof will depend on the slope of your roof, the amount of sunlight the rooftop receives, and the structural support available to hold up a living roof. Depending on where you live, government grants may be available to help you offset the cost of installation, and some cities even offer a tax break.